It will be interesting to see if the Estate does anything about this one. The Estate took Howard Mann to court for capitalizing on items he owned of Michael’s and his family’s, as well as publishing/promoting a book for and by Mrs. Jackson herself. Will they allow Darren and Martin to do the same? Who wrote the “Foreword” to this book? Which charities will profit from this one? It’s almost predictable by now who all the players will be. Time will tell. The book is set to be available May 9, 2013. -First of all, they are using artwork on the cover of the book that is owned by the Estate. Whether they took and cropped a photo of a piece of clothing they sold off with that artwork or not, is beside the point. The artwork itself does not belong to them to use on its own. If anyone else took the artwork from any official merchandise, and decided to sell items with that artwork on it, we can guarantee the Estate would stop them–unless of course the Estate gets some sort of “bennies” out of it. 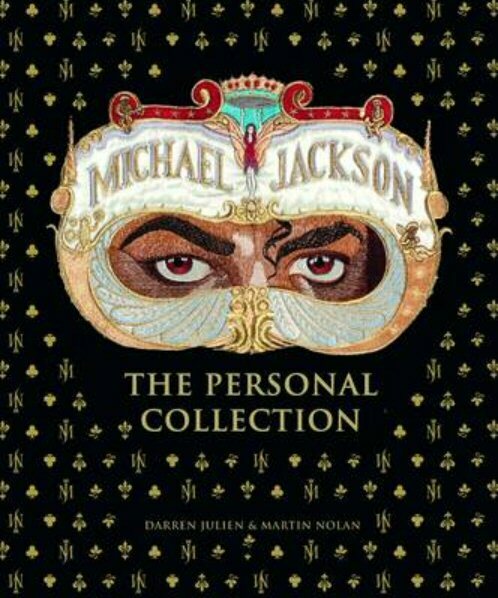 -Second, Michael settled with Juliens on the auction of his personal belongings. If they want to continue to sell that auctions catalogs by reprinting them (if it was allowed in the settlement) by all means reprint it. It also states that there are never-before-seen photographs of Neverland. Were these taken when cataloging items? Was it in the settlement with Micheal that they can sell photos they took of Neverland itself? -Third, they talk about 100 N. Carolwood in this book. Julien’s was not allowed, per the Estate, to advertise the 100 N. Carolwood auction in conjunction with Michael Jacksons’ name previously (even though they made it well known). They are now doing exactly that–AGAIN. -Fourth, it says “thoroughly researched information about each piece…” Would these be the same folks that researched the standee that was “signed by Michael Jackson” after Michael died that they listed for sale in the Dec 2012? -Fifth, exactly where does one draw the line? Mann was not allowed to make money off of the items he owned, or capitalize off of them. But Julien’s (Julien and Nolan) can make a book out of theirs? Isn’t it exactly the same thing? They are not printing a catalog of items to sell in an auction anymore, period! “It’s a chance of a lifetime for one person somewhere to have the bragging rights to say that they are going to be entombed where Elvis Presley was,” said Julien. “We’re getting a lot of response actually…people are dying to get in to it.” **Item pulled off the auction after fan outrage. “….I didn’t think it would blow up as big as it did,” explains Julien. “Everything we do is first class and tasteful.” **Item pulled off the auction at the request of the family. “I’m assuming it’s a personal nature, and we wanted to honor the request and continue our good relationship with Ms. Presley.” **Assuming? It took Lisa Marie to get that item pulled. If she wasn’t alive, it would have been sold. “Some people may see it as kind of morbid because he died of a drug overdose…” ** Item WAS sold. Elvis’s wife from 1967 to 1973, said she is “very disappointed” that Nichopoulos would allow the auction of the prescription bottles. “That a doctor betray a patient, who trusted his professional advice, trusted his integrity, trusted his right to privacy, but mostly his loyalty, is beyond my comprehension,” she said in an e-mail.